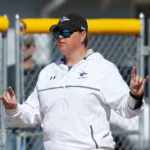 The UNK softball team has been picked to finish 11th in the 2019 MIAA preseason coaches’ poll. Head coaches vote on the makeup of the poll and cannot vote for their own team. Defending regular season champion Washburn is the preseason favorite, with 11 first place votes. In 2018, UNK went 16-20 (10-15) to finish in 10th place in the league standings. The majority of that squad returns including four All-MIAA selections in senior third baseman Cheyenne Hamilton, junior outfielder Alexis Howe, junior first baseman/pitcher Sara Sempek and junior outfielder Lex Ray. The Lopers open the season this weekend at the annual Kelly Laas Memorial Invite inside the “Husky Dome” in St. Cloud, Minn. The Lopers will face three members of the Northern Sun Intercollegiate Conference (NSIC) in St. Cloud State, Concordia-St. Paul and Minnesota State-Mankato.